You have some CRC errors but they are within tolerance. They may get worse if you go to ADSL2+ because ADSL2+ is less tolerant of line errors. If you have any extension wiring in your house you can check if this is causing any problems "which it often doe's" by removing the bottom half of your BT master "main" socket face plate in there you should find a test socket, plugging your router direct into that connects you straight on to the BT line disconnecting any extensions. If the errors improve then you can improve the extensions by making sure that only 2 wires are connected in each socket to pins 2 and 5, also avoid the use of plug in telephone extension leads. The faster speed your connection runs at the more errors will be generated by any poor wiring. Yes, the errors will definitely go up as currently you have a noise margin of 14.2db. Uncapped and on ADSL2+ your sync would rise so noise margin would fall. When you do the test socket comparison, look also for a rise in your noise margin (the sync won't change as you're capped at 8096kbps). If it jumps more than a couple of db then you have room for improvement in your wiring. With your attenuation you're definitely an ADSL2+ candidate. Last edited by Saturday; 23-08-07 at 05:02 PM. so how do i go about going on adsl2+ without any arguments with sky staff? would i need to email sky? and show them my router stats. Then they would believe what speed my line is actually capable of getting? or would it be better to give them a ring, go down that road? or email them? If I rung them what do i say?? You need to get past Tier 1, as I said in the other thread tell them you were capped because of a previous fault which is now fixed and you need to speak to Tier 3 to get the cap removed. Dont discuss ADSL with Tier 1 they wont understand. The best time to get through to Tier 3 is late at night or early morning. and the telephone number to get hold of tier 3 is...?? As I said b4 you need to get past tier 1 so you ring the normal number! ok so i rang the normal number, spoke to tier 1, a lady, told them my phone line had a fault and was capped at 8mb, and now the fault is fixed, and I wish to speak to tier 3, to take take the cap off, she did say my line was capable of getting a 3.5mb connection, like before. 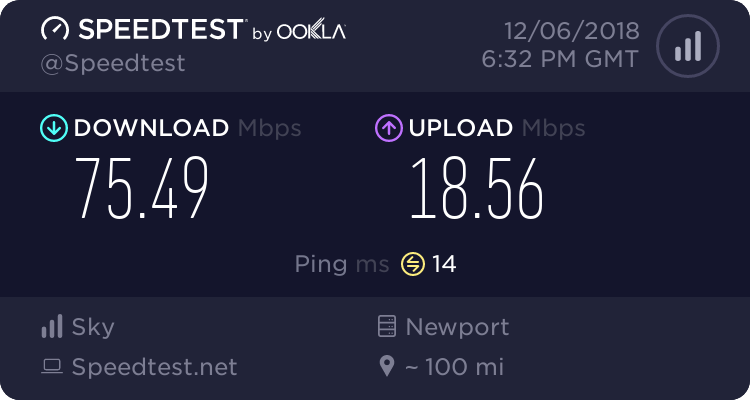 I argued that i live 720 meters away from the exchange, and that I should be able to get more than a 3.5mb connection. I did not speak about ADSL/ADSL2. She asked if was using my master socket, etc, and asked if had a horizontal face plate, Told them I was using the microfilter on my test socket, and not the face plate socket. she put me on hold for about 1 min, to see if she could get through to tier 3, she came back saying she couldn't get hold of tier 3, and that she was put on a waiting list, and was given the ticket number, which I must give when tier 3 ring me up. Last edited by jdsimp1234; 24-08-07 at 12:35 PM. do broadband speed tests lie to you? when they reach a conclusion, like 3.5/4mb speed? wich is strange When I am connected to sky bb, and can download at something like 840kbps or a bit more. I tested that with a big download. Before Sky BB, my top speeds were 640ishkbps with my face plate socket. When i started to use my test socket instead, just before I was activated for sky bb, i was getting a 705kbps speed. Was using Plusnet 8mb with a allowance of 40gb usage at £29.99 a month. what does all this tell me? ?